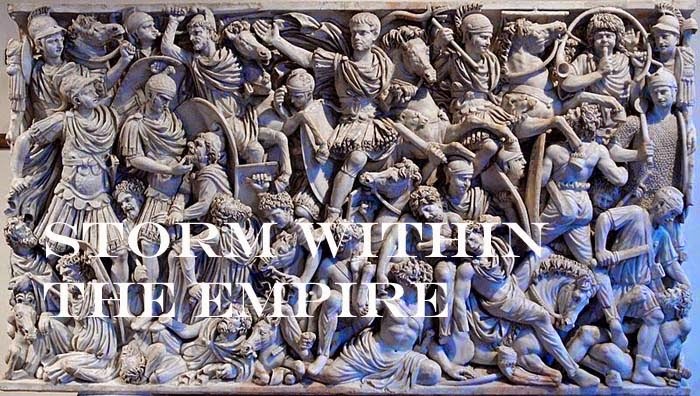 Storm within the Empire: Migration to Kingdom – Moving forward. Migration to Kingdom – Moving forward. Looking at events following the crossing of the Pyrenees in 409 AD, each of the migrating tribes (Vandals, Suevi and Alan) sought to claim a portion of Hispania to settle in. What transpired in the next two decades permanently severed Hispania from Rome leaving one of the three migrating nations to dominate the peninsula and one other to depart to the African provinces. Readers interested in this and other developments of the Western Empire I can recommend Ian Hughes’ book Patricians and Emperors; this is a well documented treatment of the era with 25 maps tracing the major turning points in Rome’s final chapter. The next step in the Migration to Kingdom theme is how best to address the next two decades with its barbarian rivalry and feeble attempts by Rome to restore control over Hispania. I seriously doubt there are many among us who would relish playing the same theme for twenty evenings, so there will be a need to “compress” play into a manageable time frame. Other aspects such as adding diplomacy, local resistance by the inhabitants, piratical forays and movement across seas will need to be added to the basic rule set to include the modifications made with the last project. The map shows the peninsula divided into the five diocese, these will facilitate movement.